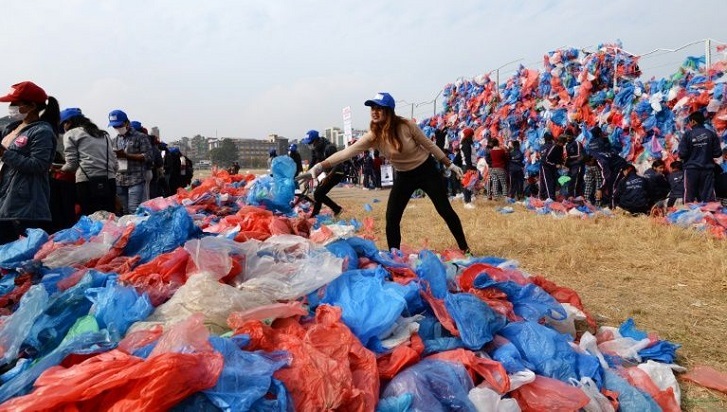 "We decided to tie plastic bags and make a sculpture of the Dead Sea to spread awareness over the world to minimise waste of plastic," Surgeon BC of Stem Foundation Nepal, the group that organised the event, told AFP. It is estimated that two to five percent of plastics wind up in the oceans, where much of it breaks down into tiny particles that harm marine life. Over 150 volunteers worked for months to collect and sort used plastic bags from schools and public areas. Among the participants was 20-year-old environment student Prakriti Pandey.